As two organisations with a significant shared global presence, CARE and IHG have been working together for over six years to deliver life-saving responses to disasters around the world. As the partnership has developed we have begun to focus on the whole cycle of disaster response and recovery to invest in disaster preparedness and longer-term resilience programming. In an increasingly interconnected world, the impact of disasters and emergencies ripples throughout value chains, between communities and across businesses. As a company with more than 350,000 colleagues working in over 5,200 hotels, the impact of a humanitarian crisis on IHG’s core business, employee communities and value chains can be significant. Providing True Hospitality is central to IHG, and its hotels play a significant role in the communities in which they are based. This includes responding to the needs of affected populations, which is central to IHG’s values-led approach. 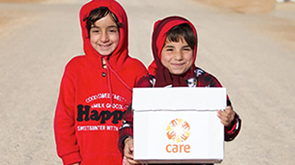 As a partner, CARE has a humanitarian mandate to reach 20 million people affected by humanitarian crises by 2020 and in the event of an emergency occurring, is usually the first to arrive and last to leave affected populations. CARE and IHG have worked together since 2011 to address the needs of communities in crisis. During this time, the partnership has had a focus on disaster response and recovery with support from across IHG for CARE’s humanitarian responses wherever they are in proximity to IHG colleagues, communities, hotels or business. The success of the partnership has been in its relevance to the commercial objectives and value-driven principles of IHG’s business and its coinciding contribution to CARE’s global programme goals. As the partnership has grown in strength and depth, there has been an increasing focus on developing global connections between the two organisations in support of disaster preparedness and planning. This increased scope has included programming in disaster risk reduction in the Philippines and discussions with IHG and CARE security and risk teams to identify, and make connections in, disaster hotspots around the world. In February 2016, IHG launched the IHG Foundation, a not-for-profit organisation working to achieve long-lasting benefit for communities all around the world. CARE International UK was one of the first grantees of the IHG Foundation. In 2016, the partnership was a finalist in the Business in the Community Responsible Business Awards; a testament to the strength and depth of the collaboration. As the partnership grows in presence and understanding, we are now looking to develop our emergency preparedness and resilience programming in addition to continuing to support life-saving humanitarian response. The IHG Foundation supported the development of CARE’s Gender & Shelter Good Programming Guidelines in November 2016. Read about CARE and IHG Foundation’s visit to the Philippines in September 2016. IHG Foundation supported CARE’s global shelter training in March 2017. Read more stories about the impact that the partnership has had in response to disasters around the world.